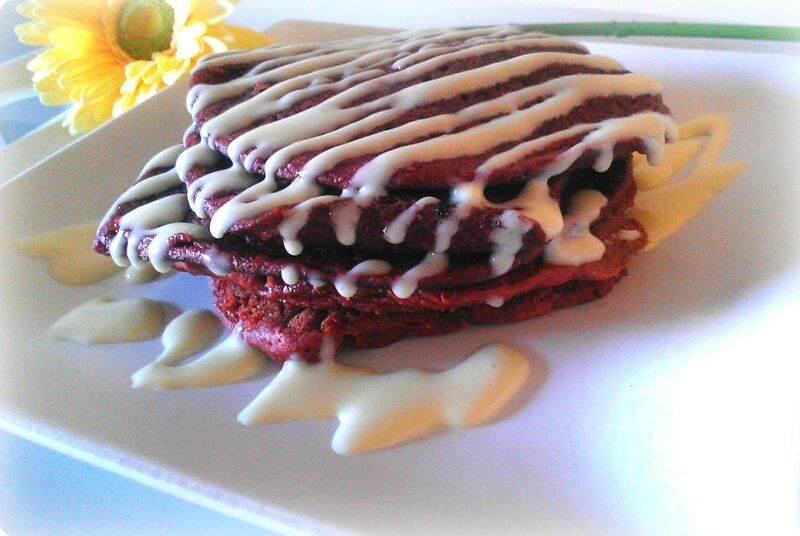 There are a plethora of recipes for delicious red velvet any and everything. However there are very few options that I found that are vegan friendly. 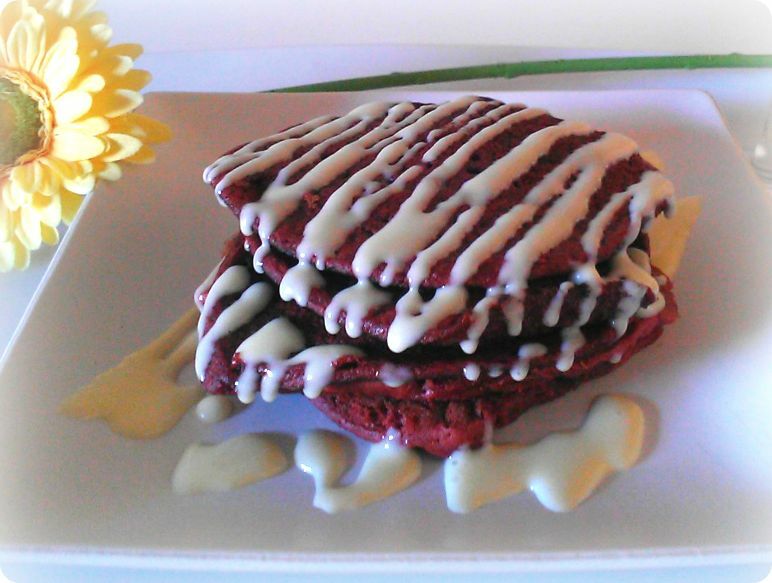 I like to pretend that these pancakes are super healthy and not as sinful as other red velvet pancakes because they are 1) vegan and 2) whole wheat. The reality is that they are just as sinful but most importantly, just as delicious. I made these for D-Money for breakfast yesterday and he couldn’t believe they were vegan and asked when we would be having them again. When he asks for repeats, I know it’s good. The coolest thing about these pancakes is the batter can be made ahead of time and jarred for later use. Serves: A lot! Seriously, I only made 8 medium pancakes and jarred the rest. My guess is that we will be getting at least 20 pancakes from this batter. In a medium mixing bowl, whisk the dry ingredients: organic wheat flour , cocoa powder, baking powder, baking soda and salt. In a small bowl or cup, place the 2 cups soy milk and add in the white vinegar and let sit for a few minutes while you do the next steps. In a large mixing bowl mix the sugar, butter, the remaining 1/2 cup soy milk, vanilla extract and the food color. Start heating a pan for the pancakes over a medium heat. Now add the soy milk and vinegar to the large mixing bowl with the wet ingredients. Mix well. Slowly add in the dry ingredients until you have a semi thick batter. Add more flour if necessary. 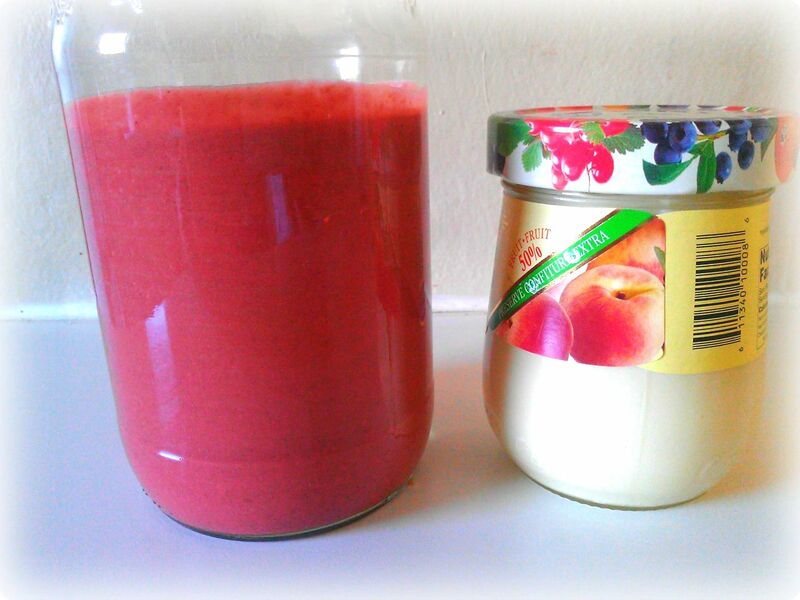 In a blender add the ingredients for the creamy glaze and blend until smooth. Can also use a hand held mixer. I like the glaze to be rich, thick and creamy but you can add more soy milk if you want to thin it out a little. Place some of the glaze in a Ziploc bag, snip off a small corner for drizzling. Now, ladle a large spoon of batter onto the hot pan and wait for bubbles to form then flip and wait a minute or two and then remove from heat. Repeat until you have the desired amount of pancakes. If there is left over batter and glaze, jar and refrigerated (use within a week). Let me know if you decide to make these and how they turn out! 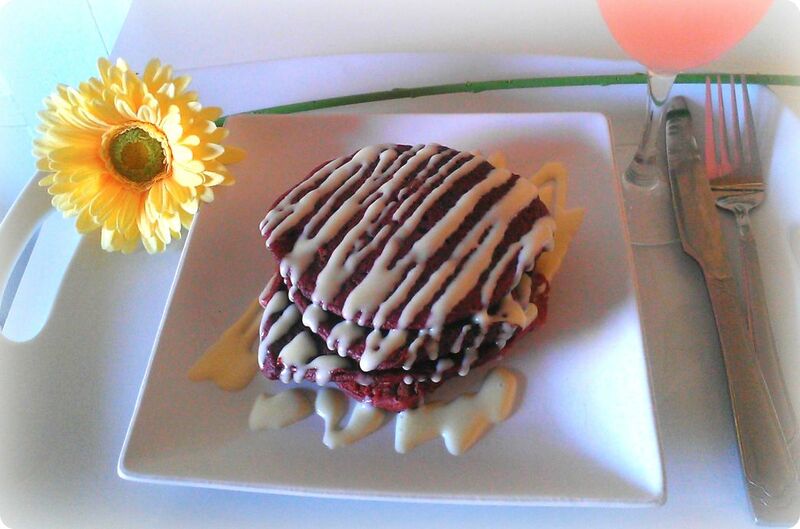 They are definitely a new favorite for not only Valentine’s Day but those awesome brinner nights as well in our home. Don’t forget to check back Wednesday for a yummy vegan cupcake recipe to share with friends! This is a very interesting combination of ingredients! I’m definitely bookmarking this! Glad to hear it and let me know how you like them! The ingredients are interesting but you won’t be disappointed! sounds amazing, can’t wait to try this! Awesome and please let me know what you think!